The books I should be reading include Beijing Coma by Ma Jian set in Beijing; The Foreigner by Francie Lin, set in Taiwan, and The End of East by Jen Sookfong Lee, set in Vancouver's Chinese community. All are novels that reveal aspects of the Asian experience in various countries and environments. Semi-serious books. But I am heading straight for books that are my first love - mysteries! Am finishing the Alaskan mystery by Sue Henry, and have picked up a Mystery of Antiquity and a Pennsylvania Dutch Mystery, both by Tamar Myers. Then there is the new Sujata Massey mystery I found, set in Hawaii. Alaska is spellbinding, Tamar Myers is funny and witty and clever, and Sujata Massey is intriguing. Which set of books would you choose first? I knew there was a book waiting for me when I hotfooted it over to the library on Friday. 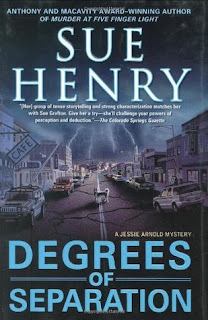 There it was on the new releases shelf - Degrees of Separation by Sue Henry, a mystery set in Alaska, with its dog mushers and Iditarod dog races. I wasn't expecting the book, nor did I know about it before I caught sight of it, but the novel was just the thing I was waiting for. In other words, it fit the mood I was in. Jessie Arnold, a kennel owner and dogsled racer, has started to train her dogs for the Iditarod again after being laid up with a knee injury. But first she has to take care of her ailing dog Pete, an old faithful who had run with her in several dog sledding races over the years. Jessie takes Pete in to the vet because of his breating difficulties and the vet advises her to let him go peacefully instead of letting him die at home with increasing painful breathing. She does that, and afterwards takes old Pete home to be buried behind her cabin where other dogs also lie. It's only a novel, but I was reminded of my own Harvey, whom I still miss, and who had to be let go in June because of his own breathing difficulties. 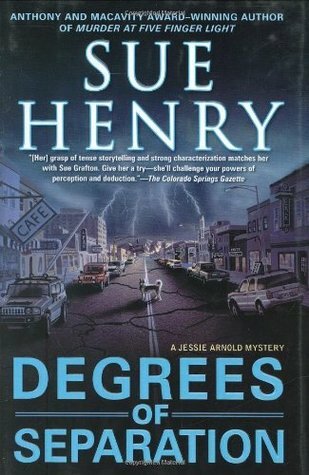 With the heart- tugger opening story of Pete, I'm now ready to read on as the novel moves to the mystery and the inevitable crime that Jessie will solve up there in snowy Alaska, in the middle of October, in her new book, Degrees of Separation. The samurai's garden has a pond with carp, a wooden bridge, pine trees, among other things, and is in a small town near the sea, a couple of hours from the city of Kobe. 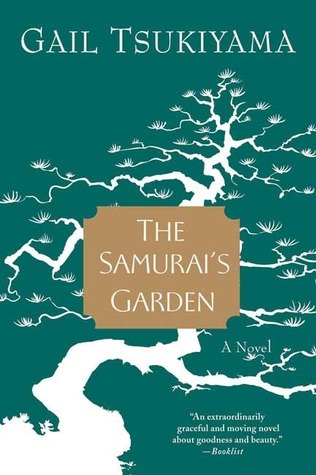 The novel The Samurai's Garden is written by Gail Tsukiyama, an author who has a Chinese mother and Japanese father and who lives in California. Her novel is set in Japan, and is about a Chinese man who grew up in China but who is visiting his father in a small seaside town near Kobe to get away from the war back home and to recover from tuberculosis. Ironically, the war at home in China is the Sino-Japanese war, when the Japanese take over Peking and eventually Shanghai, and later, Hong Kong. The young man is taken care of by a taciturn man, who has served his father's family for years and who loves to garden. While convalescing in Japan, the young man meets and gets to know two young girls who live in the small town as well as a woman who lives in a leper's colony but who comes to help the "samurai" caretaker with the gardening. That's where I am at the moment in the book. There are many sections that are quotable, though I haven't included here any quotes from the Samurai's Garden. I can only say that the peaceful environment of the garden, with a convalescing Chinese man being taken care of by a quiet and sensitive Japanese gardener is in direct contrast to the situation in China, which they hear about in the news and from letters. I'm fascinated by stories of Shanghai during the late 1930s under Japanese occupation, from all points of view. Also reading The Stone of Heaven about an emperor's obsession with jadeite, a green stone found in the southwest of China. Many of the pieces he had carved are in Beijing's Forbidden City. 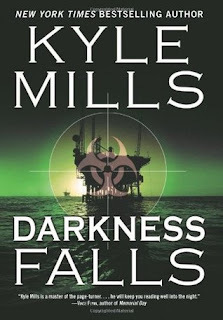 Now that the environment, global warming, and especially fossil fuel (oil) are foremost on our minds and in the news, and especially the new focus on Alaskan oilfields, I thought posting this review of the novel Darkness Falls would be timely. I reviewed the book several months ago for New Mystery Reader and have to admit that I was surprised that I enjoyed the unusual plot once I had read it. 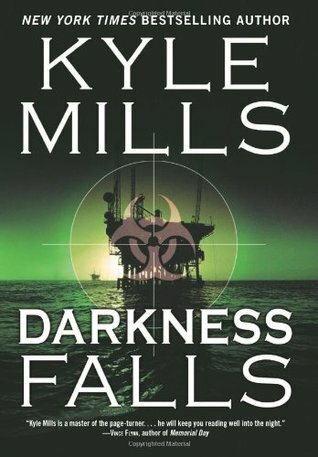 In Darkness Falls, an environmental thriller by Kyle Mills, one of the main characters, Jenna Kahlin, makes the mistake of her life when she helps a rogue environmentalist carry out his extreme solution to global warming, global pollution, and the slow destruction of the environment. She helps him by taking the bluprint of another biologist, Erin Neal, and using that research to create a voracious oil-eating bacteria that could spread unchecked through oilpipes and underground oilfields, literally destroying them and drying up major oil reserves. The bacteria, however, would be contained, as it would be harmful only to oil and would die quickly on contact with oxygen and the air. She does this only to preserve the Alaskan environment and to stop oil drilling in Alaska's Arctic National Wildlife Refuge. Little does she realize that her partner in that successful venture, Michael Teague, had plans for "preserving" not just Alaska, but the environment of the entire world. When the same bacteria shows up thousands of miles away in Saudi Arabia, destroying major oilfields and oil reservoirs there and threatening major supplies to the United States, Erin Neal is forced out of his self-imposed exile and hermit's existence to find a way to stop the advance of the bacteria. The author paints a convincing picture of doom if major oil sources were to suddenly dry up. Our dependence on oil for housing, food, and our basic daily needs is brought home in the course of the book. How Jenna and Erin, together with Homeland Security manager, Mark Beamon, race against time and pit their wits against mastermind Teague, is the basis of this novel. Members and subscribers of the Mystery Readers Journal are now in the process of voting for the best mysteries of the year. Here are two of the categories they have announced for the annual Macavity Awards for books published in 2007. Those interested in joining and voting can do so on the Mystery Readers Journal website. There is a fee to join up or subscribe. I haven't read any of the above books, but they are on my list! I have heard Santa Fe and Taos, New Mexico are exotic (to us in the midwest) locales and since I've never visited the desert, I've been intrigued by Native American Indian culture in the southwest, cacti, fence lizards, snakes and other creepy crawlies, and most importantly, the blooming of the arts in New Mexico. So it ws no surprise I picked up a book that had Sante Fe in the title and was also a mystery. 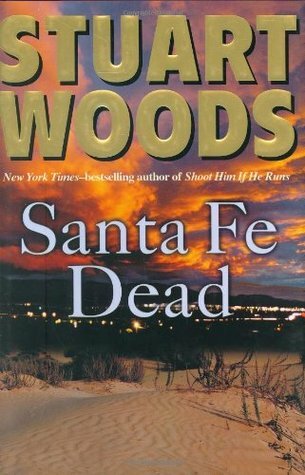 I finished Santa Fe Dead by Stuart Woods in record time, reading it in every spare moment. I didn't get a lot of info about New Mexico but I did get a good plot with interesting characters, most particularly the villain. 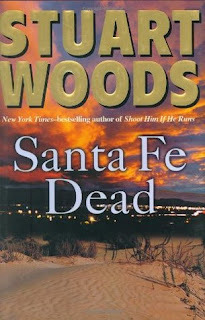 Unfortunately, I couldn't get up an interest in another of Woods' books, Beverly Hills Dead . The book is set in the McCarty era when many actors were blackballed and careers in the movie industry destroyed. Old stories, I thought. As a resulty, I scouted around for other books and found Stone of Heaven in a used bookstore/coffeeshop, about the historical importance of jade in China and the East. Written by two British journalists, the research takes us into historical and modern day Burma, China, India, and a few other places. The history of jade goes back to the Yuan, Ming, and Qing dynasties. I'm really enjoying all the stories, myths, and the symbolism surrounding this stone. Winter Study by Nevade Barr, published 2008. 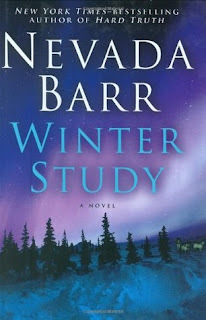 Am now reading Winter Study by Nevada Barr, a popular novelist and a favorite of mine. It's set on the Isle Royale in Lake Superior near the Canadian border and deals with the scientific study of wolves. In this book, there is a giant animal, possibly a wolf/dog hybrid that is terrorizing the wolf population as well as the scientists on the island in the Wolf Study project. Of course, as you read on, the evildoers turn out to be. as expected, not the animals, but humans. A friend's reading a book about China reminded me of the 18th century classic story, Dream of the Red Chamber, which describes in detail the lives of men and women behind the walls of a large family compound in traditional China. It's basically a love story about two young people who grow up in the compound that houses a large extended family and whose love for each other is thwarted by the matchmaking of the matriarch in the family. Dream of the Red Chamber by Tsao Hsueh-Chin is available used and new on Amazon and probably in many college libraries, if not in a large public library. I recommend it for its portrayal of life in the old China, particularly among the women of the time. I read the book (which comes in two volumes) many years ago and plan to go back to it, hopefully with a new perspective (age and all that). An armchair traveler like myself gets a kick out of reading books that combine mystery, adventure, and information about other countries. 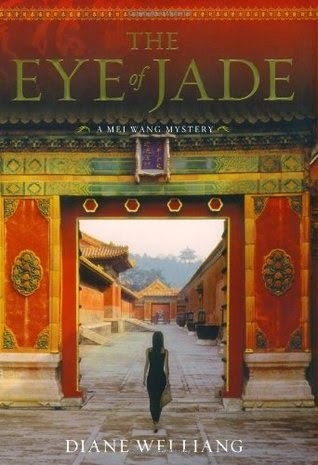 One of these is The Eye of Jade, set in modern day Beijing, where a young detective Mei Wang hunts for a missing piece of Han dynasty jade and comes across a murder in the process. The book describes interesting scenes from every day life in Beijing - the food, traffic, modern apartment buildings, the mixture of old and new, and life in the 1980s after Mao Tse Tung. The author, Diane Wei Liang, was born in Beijing and took part in the Tiananmen Square demonstrations in 1989, so I trust her observations. I have also started The Abyssinian Proof by Jenny White. set in Istanbul, Turkey. The main plot is a little far-fetched, reminding me in this respect of The Da Vinci Code, as it's about a missing silver box, lost since 1453, that contains the proof of the existence of God. The main character, local magistrate Kamil Pasha of Istanbul, is caught up in the drama as the book takes up the story in 1887. Life in Turkey in the late 19th century is described in detail, and the city architecture features prominently. The book is written by a professor of anthropology at Boston University whose expertise is in Turkish politics and society. And then there is The Moon in the Mango Tree by Pamela Binnings, which takes place in Siam in the early 1900s. An aspiring opera singer marries a young medical missionary who takes her to the northern jungles of Siam, now Thailand, where she is instantly criticized by older missionaries and their wives for being too modern and liberal in her views. She had been a supporter of the vote for women and marched at home in Boston with the suffragettes! A former lawyer, now novelist, the author must have done some serious research about Siam the the royal court at the time.